CHICAGO (AP) — Jose Quintana dazzled all night long. The Chicago Cubs had the right guy on the mound for a big game against the Milwaukee Brewers. 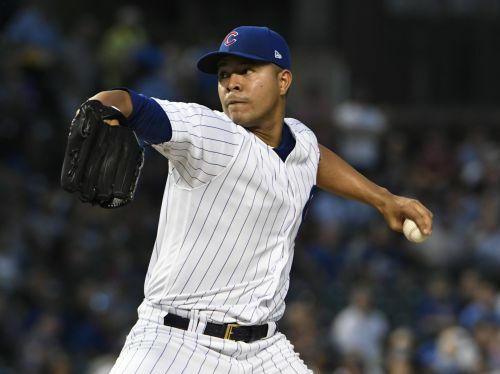 Quintana pitched three-hit ball into the seventh inning, Victor Caratini drove in two runs and the Cubs beat the Brewers 3-0 on Tuesday to regain their two-game lead in the NL Central. Quintana (13-9) continued his mastery of Milwaukee in a huge spot, improving to 6-2 with a 1.60 ERA in 10 career starts against the Brewers. The veteran left-hander struck out seven and walked two in 6 2/3 innings in his second straight victory over Jhoulys Chacin, also winning at Milwaukee last Wednesday. "He always throws well, it seems, against the Brewers," manager Joe Maddon said. Quintana received a standing ovation from the crowd of 37,017 when he departed with the bases loaded after a replay review awarded an infield single to pinch-hitter Hernan Perez. Justin Wilson then struck out pinch-hitter Manny Pina on three pitches, preserving Chicago's 2-0 lead and drawing another loud roar at Wrigley Field. Jorge De La Rosa pitched a perfect eighth and Pedro Strop finished the three-hitter for his 13th save in 17 chances. Shortstop Addison Russell made an outstanding backhanded stop to retire Ryan Braun for the second out of the ninth, drawing a jaw-dropping reaction from teammate David Bote at third base. Ben Zobrist led off with a grounder that skipped by second baseman Jonathan Schoop for an error. With one out and runners on second and third, Chacin threw the ball into center field in an apparent miscommunication with shortstop Orlando Arcia while trying to pick off Javier Baez at second. "I got a sinker on my hand and just the ball sailed a bit more," Chacin said. "But like I said, I was trying to set up the pickoff there and was just waiting for Arcia to get on the base." "I felt really good up there," Caratini said through a translator. "I was just trying to have quality at-bats and luckily I had really good results." Quintana threw 108 pitches, 68 for strikes. He is 3-0 with a 1.84 ERA in his last five outings overall. "We've been unable to solve him for sure," Brewers manager Craig Counsell said. Brewers star Christian Yelich reached safely for the 27th straight game when he walked in the fourth. It's the longest active streak in the NL and matches his career high set in 2014. Cubs: LHP Jon Lester, who left his start on Monday night with lower back tightness, said he didn't feel great on Tuesday, but he didn't think he would miss any time. If the Cubs are rained out Thursday in Washington — the forecast is a bit dicey — they could adjust their rotation to provide more rest for Lester. ... OF Kyle Schwarber (back) was unavailable. ... RHP Brandon Morrow (right biceps inflammation) is scheduled for another bullpen session on Wednesday. "One moment at a time, try to evaluate it afterwards and see where we're at," Maddon said.